A picture taken on February 11, 2018, shows the 75-storey Gevora Hotel (C), which stands 356 metres or nearly a quarter of a mile tall, in the Gulf metropolis of Dubai.Gulf metropolis Dubai, on its never-ending quest to break records, announced the opening of the “world’s new tallest hotel” Sunday, pipping another towering landmark in the city for the title. Gulf metropolis Dubai, on its never-ending quest to break records, announced the opening of the “world’s new tallest hotel” Sunday, pipping another towering landmark in the city for the title. The gleaming gold 75-storey Gevora Hotel stands 356 metres, or nearly a quarter of a mile, tall. The new record-holder is within view of its predecessor, Dubai’s JW Mariott Marquis — just one metre shorter. The Gevora’s first guests are expected on Monday, according to Emirati daily The National. Dubai is also home to the world’s tallest building, the Burj Khalifa, which pierces the city skyline at 828 metres (half a mile) high. 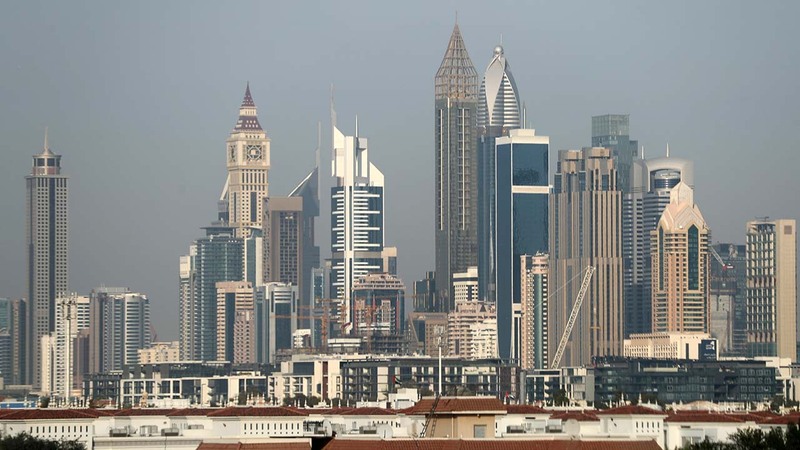 The city-state, one of seven sheikhdoms that make up the energy-rich United Arab Emirates, aims to attract 20 million visitors annually by 2020 when it hosts the global trade fair Expo 2020. A major transit hub situated on transcontinental air routes, Dubai airport was the world’s busiest for international passengers in 2017 for the fourth year running, with 88.2 million travellers.